I managed to get four books read this month, I'll take it. Some weeks were a little busier than others so I didn't get much time to sit down with a book but overall I finished some really good stories for February. What was on your bookshelf this month? 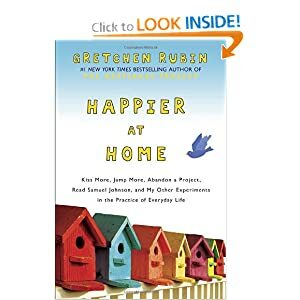 I really enjoyed Gretchen's first book, The Happiness Project, so it didn't take me long to reserve her latest book from the library. In Happier at Home, she tackles yet another happiness project only this time focusing on things at home. While I think I really did enjoy her first book a little more, this time around I found some parts where I was losing interest; it was an okay book. Not one of my absolute favorites but I did feel inspired by a few things I read. I really enjoyed reading about the months during which she focused on spending more time with her husband and her children. I loved her Wednesday afternoon dates with her oldest daughter, it's important to spend one on one time with your kids and this was a great example. I've had this cookbook for several months now and had yet to read it. I don't know what I was saving it for because I knew it was one I really wanted to sit down and read through. 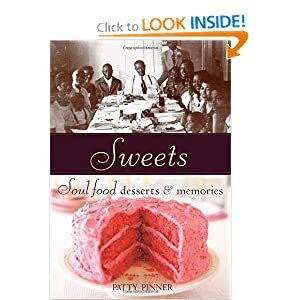 Sweets: Soul Food Desserts and Memories is probably one of the best dessert cookbooks I've ever read through. I love reading the stories behind treasured family recipes and I especially am drawn to southern cooking. Most of the recipes call for simple, everyday ingredients and I can't wait to try some of them out! I first heard about Amy's book while searching through Pinterest one day. I enjoy reading books about homemaking and those similar subjects so I knew this would definitely be one I would like. 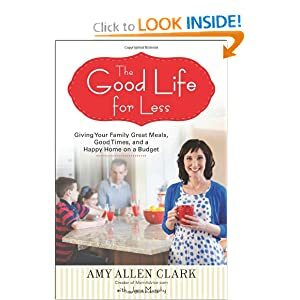 The Good Life for Less is filled with tons of tips for cutting costs in your home and budget, frugal ideas for holidays and gift giving, as well as helpful household cleaning/organizing hints. Oh and did I mention there's a nice selection of recipes?! All which are pretty frugal, yet delicious. I happened to have already tried Amy's Snickerdoodle Doughnut recipe and they are fantastic! My only complaint regarding the book would be, I wish Amy would have told more about her own family's journey regarding getting out of debt and learning to live this lifestyle in which she writes about. I found The Homemade Pantry at our local library one afternoon while browsing the new bookshelf. I'd remembered glancing through this at the bookstore but was hoping to sit down and really read through the whole thing. I try to prepare many of our foods from scratch and this was filled with so many great, everyday staples that all of us eat. Alana keeps it real, but also makes it seem so simple to make your mozzarella or pasta. 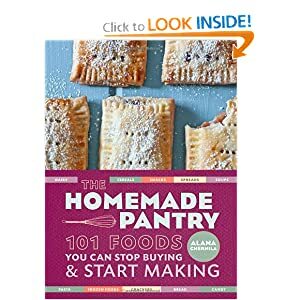 I was definitely inspired to branch out and try to make some of my own homemade pantry staples.